Smith Dairy of Orrville, Ohio, clearly has the right idea about fall and ice cream. Smith has just introduced its seasonal ice cream flavor for fall, Ruggles Pumpkin Pie ice cream. pie ice cream and pieces of pie crust. 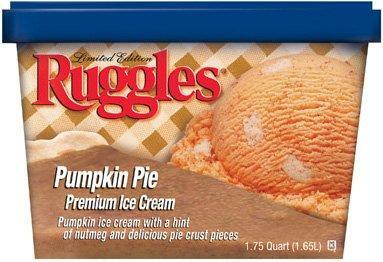 Ruggles Pumpkin Pie features premium pumpkin pie flavored ice cream and pie crust pieces. Freeze leftover coffee in ice cube tray to use in your milkshakes. One cup liquid equals about 10 cubes. Crush the coffee ice cubes in a blender. Add the remaining ingredients with enough milk for desired consistency. 2% reduced fat, 1% low fat or fat-free skim milk may be substituted. Pumpkin Pie ice cream is available during October while supplies last in the market area served by Smith Dairy, which is Ohio and parts of Michigan, Indiana and Pennsylvania. Suggested retail price for a 1.75-quart is $5.29 to $5.99. TFFG SAYS: Too bad more ice cream companies don’t issue seasonal flavors. The best we seem to get is a baseball-themed ice cream, which usually means they just gussy up the packaging and call it the “ice cream of the New York Yankees” or something along those lines. Big deal. Show me an authentic Yankee blue pinstripes and premium ice cream and we’ll talk. Smith and its Ruggles brand are spot-on with their terrific line of seasonal ice creams and this is just a run-up to all the great ice creams and dairy products (eggnog among them) that they roll out for the Christmas holidays. A neat twist on this milkshake recipe might be a shot of brandy or rum, which then makes it a Super Duper Rum Pumpkin Pleaser! What better way to stave off the first frost of the year while basking under a bright, full “harvest moon.” It could be just the thing that a harried hostess needs after a long, hard Thanksgiving day of turkey roasting, mashed potato making, pie baking, dish washing——and a houseful of (gasp) in-laws! !